The AoFA Level 3 First Person On Scene is a significant step up from the First Aid at Work Award. The course is recognised for SIA registered Close Protection Officers. 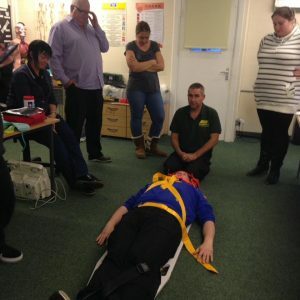 The course is not a basic first aid qualification, this course introduces the first responder to patient care, patient observations, catastrophic bleeding and much more over an intensive four days. It is designed to give advanced first aid skills in a pre-hospital environment prior to the arrival of the emergency services. Airway management (OP and suction). Qualification: First Person on Scene – Intermediate Certificate. Cost: £300 per person + VAT on open courses. Minimum of 4 and maximum of 12 students for in-house courses.